How are bananas grown commercially? Banana plants (their lack of a central woody stem means they are plants, not trees) can grow to heights of 10 meters (30 ft), with leaves up to 4 meters (12 ft) in length. Banana plants grown commercially are usually much lower in height for ease of management and to limit wind damage. Each individual plant produces a single stem. Each stem contains six to nine clusters of bananas (“hands”), each with 10 to 20 individual bananas (“fingers”). Commercial banana stems each produce six or seven hands with 150 to 200 bananas. Each stem weights between 20 and 50 kg. A typical banana plant grows to a size with harvestable fruit in nine to 18 months. 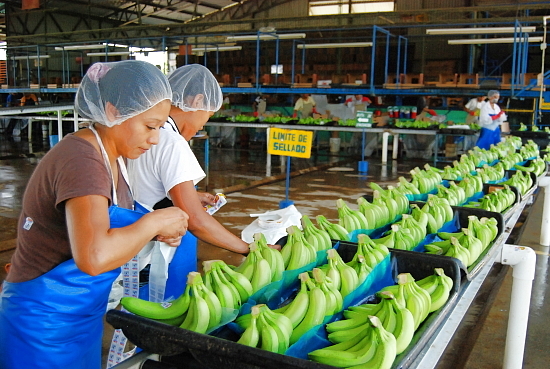 Harvesting bananas is often done by workers in pairs, with one cutting the fruit off the stem and the other catching the bananas to prevent them striking the ground and being damaged. After the fruit is harvested, the stalk dies or is cut down. In its place one of more “daughter” (or “ratoon”) plants will sprout from the same underground rhizome that produced the mother plant. These shoots are genetic clones of the parent plant. Banana plants require rich soil, nine to 12 months of sunshine and frequent heavy rains (2000-4000 mm/yr), generally more than can be provided by irrigation. Bananas are either spayed with pesticides or wrapped in plastic for protection from insects. Wrapping the fruit also reduces the bruising caused by friction with leaves in windy conditions. Bananas are easily bruised and damaged in transit, but can be picked green (unripe) and ripened quickly at destination. They are generally picked and packed on or close to the plantation. Commercial plantations of bananas often use very large areas of land, with 2000-2400 plants/hectare. Good access to transportation routes (roads or railways) is essential in order to avoid damage after packaging. Banana cultivation is very labor intensive. Banana plants are often used as shade for crops such as cacao or coffee. Banana packing plant. Credit: Sagarpa. Banana plants can easily be damaged by strong wind and entire plantations can be destroyed by tropical storms and hurricanes. Fungal diseases such as black sigatoka are one of the current major issues faced by banana producers. To combat black sigatoka, plantations may be aerially sprayed with pesticides from helicopters. Black sigatoka has already reduced banana yields in some parts of the world by up to 50%. Fighting this disease apparently now accounts for about 30% of Chiquita’s costs. Commercial bananas have limited genetic variability and limited resistance to disease. This has led some experts to argue that fungal diseases may wipe out commercial banana plantations permanently, though the Food and Agriculture Organization (FAO) disagrees. The FAO argues that export varieties of bananas make up only about 10% of the total world banana crop, and that considerable genetic diversity remains in the plants grown for local consumption by small-scale farmers in developing countries. In Latin America, the Honduran Foundation for Agricultural Research is a leading banana breeding center and the source of many promising hybrids, including some that can either be cooked when green (like plantains) or eaten as ripe bananas. It usually takes decades to develop and introduce a new hybrid. Scientists are also working on genetically-engineered (GE) bananas that will remain ripe longer, and are trying to develop dwarf hybrids that produce large amounts of fruit for their weight, are easy to work, and less susceptible to storm damage. Morton, Julia. 1987. Banana, chapter in Fruits of warm climates. Violette Geissen, Franzisco Que Ramos, Pedro de J. Bastidas-Bastidas, Gilberto Díaz-González, Ricardo Bello-Mendoza, Esperanza Huerta-Lwanga, and Luz E. Ruiz-Suárez, 2010. “Soil and Water Pollution in a Banana Production Region in Tropical Mexico”, in Bull. Environmental Contamination and Toxicology, October 2010, 407–413. Thanks for the kind words; that does indeed sound like an interesting read!